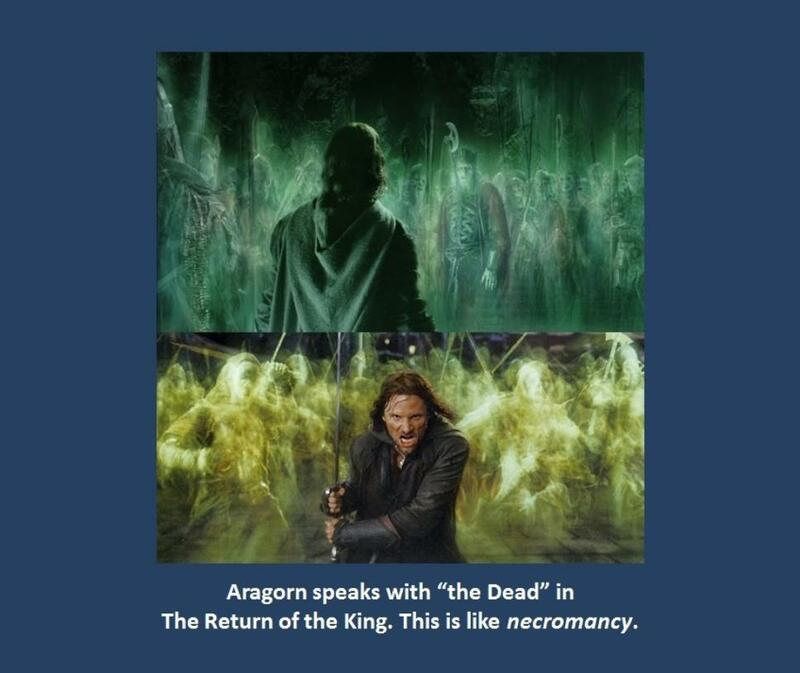 Is necromancy (a type of divination) in The Return of the King? 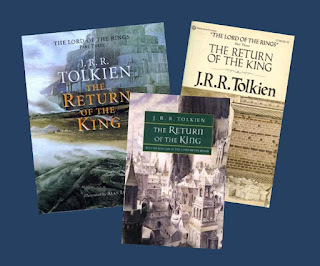 In The Return of the King novel, Aragorn finds a route that goes through territory held by those Tolkien calls “the Dead.” They are supposedly spirit beings of people who died. And, Aragorn is faced with confronting them. The practice of speaking with the “dead” is called necromancy, when seeking wisdom or knowledge by occult means. This is a type of divination. Though Aragorn was not seeking knowledge from the “Dead,” he was speaking with spirits. (To learn more about what these spirits are, click here.) Speaking with spirits of the dead (or familiar spirits) is a pagan and occult concept that J.R.R. Tolkien is promoting in his book. God forbids divination, necromancy, wizardry, and magic in Deuteronomy 18. The Dead Are in Hell Forever. In Ezekiel, we see how the dead are in the nether parts of the earth (Hell), fully awake and aware. The Bible says that some in Hell spoke to the Pharaoh of Egypt after he died and was cast into Hell, along with other dead Egyptians. 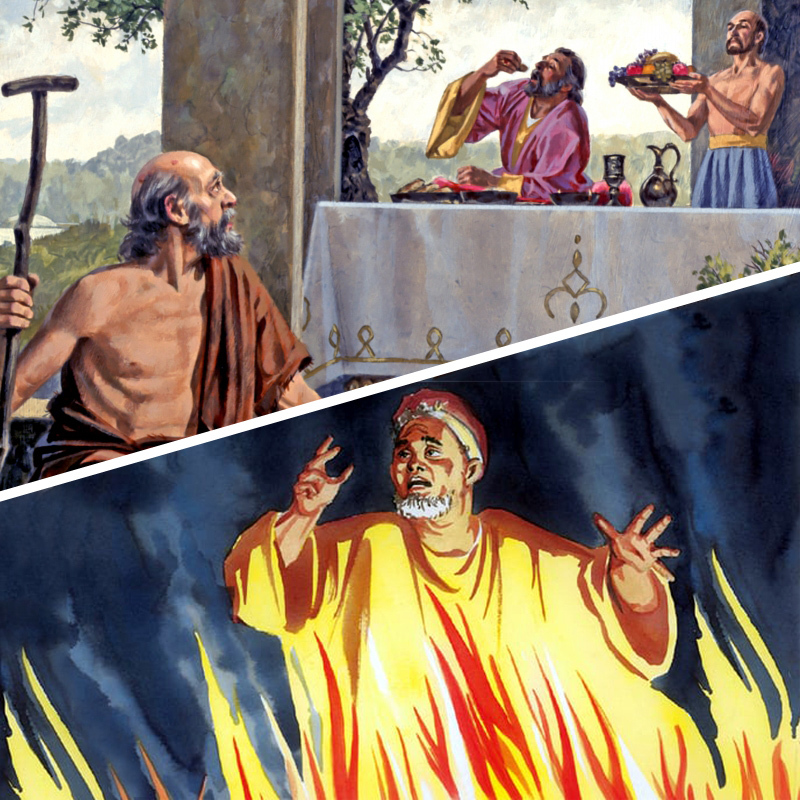 “ There was a certain rich man, which was clothed in purple and fine linen, and fared sumptuously every day: 20 And there was a certain beggar named Lazarus, which was laid at his gate, full of sores, 21 And desiring to be fed with the crumbs which fell from the rich man's table: moreover the dogs came and licked his sores. 22 And it came to pass, that the beggar died, and was carried by the angels into Abraham's bosom: the rich man also died, and was buried; 23 And in hell he lift up his eyes, being in torments, and seeth Abraham afar off, and Lazarus in his bosom. “ And he cried and said, Father Abraham, have mercy on me, and send Lazarus, that he may dip the tip of his finger in water, and cool my tongue; for I am tormented in this flame. 25 But Abraham said, Son, remember that thou in thy lifetime receivedst thy good things, and likewise Lazarus evil things: but now he is comforted, and thou art tormented. 26 And beside all this, between us and you there is a great gulf fixed: so that they which would pass from hence to you cannot; neither can they pass to us, that would come from thence. This was not a parable because Jesus actually named the poor man as Lazarus. Nor, did Jesus include symbolism in this account as he had in his parables, such as the parable of the vineyard, or the parable of the unforgiving debtor. This was an account of Hell and Abraham’s bosom, a temporary place next to Hell. Jesus Preached to the Spirits in Prison. After Jesus Christ’s earthly body died, he went and “preached unto the spirits in prison”. We also read in Ephesians 4 that Jesus Christ descended into the lower parts of the earth and led captivity captive. “ But unto every one of us is given grace according to the measure of the gift of Christ. Jesus did not bring people from Hell itself captive. Jesus did not preach to the souls in Hell. Jesus Christ preached to those in Abraham’s bosom, which was not far from Hell (separated by a chasm). Then, Jesus brought believing souls, like Lazarus and Abraham, up into Heaven. Lost Souls That Reject Christ Can Never Enter Heaven. Nothing that defiles (or is unredeemed) can enter Heaven. Getting to Know God as Our Best Friend Is the Answer to Our Spiritual Hunger. Getting to know God as our best Friend is the answer to all of life's problems and is what living is truly all about. Jesus said in John 17:3: "And this is life eternal, that they might know thee the only true God, and Jesus Christ, whom thou hast sent."